14 x 8 Steel Baseboard Return - Golden Sand Discounts Apply ! These metal return air grilles have a quality enamel finished topcoat. 14 x 8 baseboard vents feature fins placed at a 20 degree angle and spaced 1/3". Your metal return air grilles are a neutral brown color to blend easily into woodwork. Baseboard vents are made of stamped steel for durability and longevity. 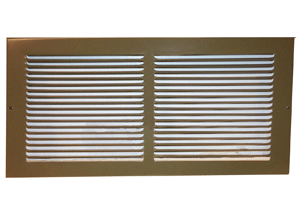 Metal return air grilles can be placed with the fins facing the direction that best hides the ductwork. Baseboard vents work great with both commercial and residential HVAC systems. ***Hint: The industry standard is to order using the actual wall hole size and not the air vent cover size. Metal return air grilles will fit a 14 x 8 inch hole opening. Return Air Grille Faceplate Dimensions (LxH): 15 3/4 x 9 3/4 inches. Metal return air grilles are offered in a variety of sizes and colors. Place your order for these quality made return air grilles in a neutral brown finish today!